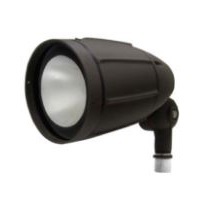 LED Bullet Flood Light features a swivel arm for precise angle adjustment. Sealed to keep out dirt, bugs and moisture, the Bullet Floods is constructed with a precision die-cast aluminum housing and tempered, shatter-resistant glass for a sleek appearance and maximum durability. The floods can be surface mounted directly to electrical boxes or posts with a 1/2” threaded bushing.